Those of you who normally read these pages will think of Carey Blyton as a composer first and foremost with towards a dozen CDs in the catalogue – piano music, guitar pieces, songs, choral works, some orchestral works, as well as music for television including his Doctor Who scores from the 60s and 70s. I have reviewed many of these for the MWI. This therefore renders a wide variety and large body of work all written for a purpose and for friends and often educational in nature. You may, if you are a teacher, be familiar with his musical mock-Victorian melodramas ‘Sweeney Todd the Demon Barber of Fleet Street’, his ‘Dracula’ and his ‘Frankenstein’ (of which I was fortunate to give the first performance thirty years ago), all published by Novello. He called these his un-holy trinity. For these pieces, and indeed for his even more famous ‘Bananas in Pyjamas’, he also wrote the words. He was as brilliant with words as with music. He kept it simple, but direct and witty with the ability to appeal to children of all ages. A number of years ago a book of Blyton’s short stories appeared. It was his Collected Short Stories with his autobiography Summer in the Country. This was published by Fand Music Press (2002), which also publishes a great deal of Blyton’s music. These stories were quirky, sometimes disturbing but more often much fun, worth exploring by any one. The ‘Doggy Tales of Arnold’ were unknown to me, despite my knowledge of the composer, having been a pupil and friend for many years. In all there are ten stories, two of which appear in this volume. They date from the last years of his life. Although a successful storybook film, narrated by the wonderfully funny and much missed Willie Rushton, was made of the second story here, ‘Arnold and the Acorns’ this is the first time any of the stories have appeared in print. And what makes them even more enjoyable are the illustrations, which adorn all of he pages, by Maurice Stevens. Like Carey Blyton, Stevens has also worked in the advertising industry and has exhibited in a variety of British Art galleries including at the Imperial War Museum. He uses vivid colours, which help to characterise the animal personalities. Arnold is brown and white with a green collar, Apricot the streetwise cat is yellow and orange as you might expect. Some pages are just illustrations allowing the reader to use a wide range of imaginative skills although the neighbourhood in which they are set will be familiar. 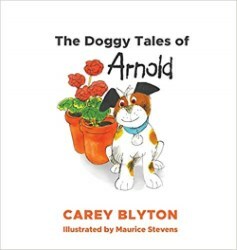 Arnold is a very small dog with an enormous bark and in the first story he meets and scares a large Afghan hound who has just moved in. He gets hitched up with Apricot, who seems to be about three times his size and in the second story they are somewhat intimidated by a pesky squirrel and an irritating mouse. Again the illustrations are brilliant, accompanying the simple, amusing stories. Who are they aimed at, you might ask? I suspect that Blyton didn’t have an age group in mind but if read by a parent using, say a variety of comic voices, the illustrations would need also to be shown all the way as they guide the imagination of the listener. But the language is such that children at the level of Stage 1 will be able to read the book for themselves. I can only hope that this slim volume will be brilliantly successful and that Carey Blyton, with the wonderful aid of Maurice Stevens, will ride again and that the other adventures of Arnold, Apricot and their rivals will soon appear and become as popular as they surely deserve.